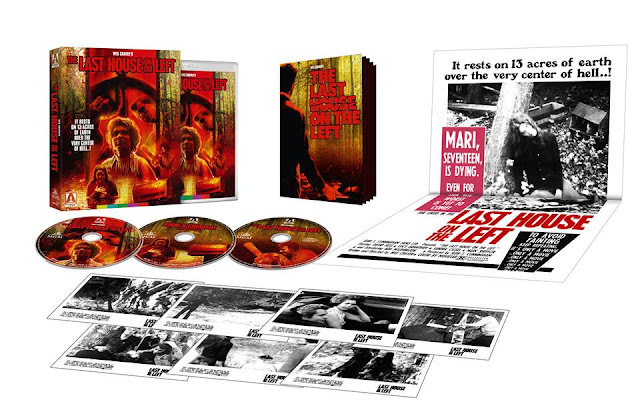 Back in February, Arrow Video announced that they were releasing a brand new blu-ray of the Wes Craven's Last House on the Left. The blu-ray was to feature three versions of the film (the unrated version, the Krug and Company version, and the theatrical version of the film plus a boatload of special features. This Limited Edition was supposed to street on May 25th, 2018. About a month ago, Arrow Video sent me, through their U.S. distributor MVD, a list of their May releases. I noticed that Last House of the Left was not listed anymore. I reached out to Arrow Video and they said that there would be news coming in the next few weeks. Today, Arrow Video announced, through their Facebook page, that their blu-ray of Last House on the Left was still coming to blu-ray, but it was being delayed a bit, but they were adding to the already bursting at the seems special features list. Below is the new list of special features and swag that is contained inside the Limited Edition box, including the film's soundtrack.